In-N-Out Burger, the family-owned, California-based restaurant chain has funded the planting of several of its signature palm trees along the center median of Chatsworth Street. Company spokesman Ennis Hout explained to GigaGranadaHills that the trees are just one of a string of civic beautification projects the chain plans to undertake in Southern California, in order to "give back to local communities while simultaneously promoting our brand." The chain has planted the trees at no cost to the city. Response to the project has overwhelmingly positive. Initially, Neighborhood Council members balked at the choice of tree, as Palm trees provide no shade whatsoever and could be seen as disharmonious with the existing landscape. At a pubic hearing on the matter, one resident suggested that Deodar trees, like those along White Oak Avenue that are now a historic landmark, would have been a more appropriate choice, not only because of their historic significance to the area but also because of the "global cooling" effects their shade would contribute. Another suggested the company go with a California native, such as Coast Live Oak, which also would provide shade. 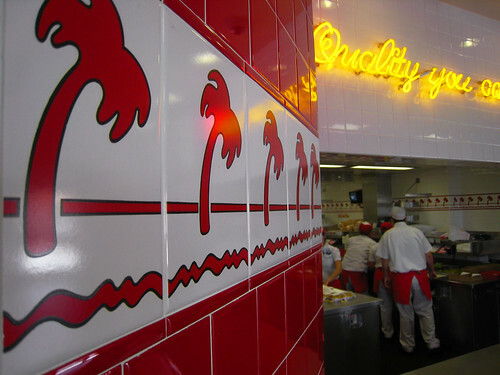 But In-N-Out officials won over naysayers, not only with a promise of picking up the tab for the planting of the decorative trees, but also by assuring locals that Palm trees would add sophistication to the area by making Granada Hills more closely resemble Hollywood. I'm all for anyone that wants to help beautify our area. Good for In'n'Out! who's going to take care of the maintenance? According to a member of the Granada Hills Business Improvement District (BID), the trees and the median improvements are all funded with BID money. IN-N-Out is not a member of BID. You had me until Ennis Hout. And happy April 2st to you to. Yeah, amazing Photoshop job on those pictures, huh? I wish it were photoshop. Those trees are UGLY and completely out of place on that median. And they just put new plants in about 18 months ago. Sigh, I would have much preferred native sycamore or oaks. I now HATE in-n-out. Love the trees!!! Gives it that updated feeling like diwn down Pasadena! The article says that In-N-Out funded the planting of the trees. "Anonomous" said "According to a member of the Granada Hills Business Improvement District (BID), the trees and the median improvements are all funded with BID money. IN-N-Out is not a member of BID." Who really paid for the trees??? Note the date on the original post. Proof once again that we are surrounded by gullible idiots! LJ and Anonymous: The trees ARE planted on Chatsworth Street. Did you two think it was a joke? How the hell is it photoshopped? Are you guys blind? The trees ARE there like the person above me stated and they're really nice - it's a major upgrade to how Chatsworth St. was before. Dude, if you can't recognize a picture of a pineapple on a stick Photoshopped onto Chatsworth Street, you're the one that's blind. You seriously think someone is going to plant those kinds of trees right in the middle of a street? Chatsworth Street truly represents the ideal of the American Dream and personally I am grateful for the boost and gift of these lovely trees for our neighborhood. Applause to In-N-Out for their generous donation! LJ: You really should stop the sarcastic comments and drive down Chatsworth Street. You may be a freelance writer, but you obviously don't do a lot of research before writing comments. Now I'd like to know, as somebody asked above, who really paid for the trees? In-N-Out or the Granada Hills Business Improvement District? LJ you're just being dumb now. Please get your facts straight before posting. 200 foot coastal redwoods would have been more appropriate. Palms are not indigenous to that part of town. The trees are hideous. Pineapple on a stubby stick indeed. The palm trees seem to me to be a striking symbol of Granada Hills lack of a coherent vision. Palm trees aren't even really trees. Technically, they're overgrown grasses. One BID member whom I spoke to referred to Granada Hills as a "Mayberry." Did Mayberry have date palms? Another commenter referred to a Spanish Colonial look. That's a great idea, but at present we don't have a lot of red tile roofs on Chatsworth Street. White Oak's majestic and dramatic Deodars -- designated as a historic monument -- create an inviting, shady lane. And the ficus trees, I agree, make for a lovely "main street" feel. Two more points for Mayberry. Palm trees evoke, for most, one of two things: (1) Hollywood; (2) the desert. Granada Hills evokes neither of these, and aspires to be neither of these. The City of Los Angeles approves more than 150 species of street trees, many of which would be perfectly in harmony with either our existing plantings, the "Mayberry" theme, or the Spanish Colonial theme. But in what biome do Ficus Netita and Date Palm normally coexist? The rosebushes were prettier. Deodars are known as a landmark in GH; oaks are native - either would have been better than palm trees, which look like they were dropped in from some failed housing development in Palmdale or Lancaster. Can’t you all just be grateful? The city is old and run down. Someone does something nice and you have to criticize. The issue is the rosebushes were fine, and more than a few of the people whose property/businesses are in the BID, which pays for this, were equally fine with them. The new landscaping was advocated by a fairly small group, who were set on the palm trees for their own reasons. A liitle transparency would have helped a lot; given that the BID's website does not exist and the facebook page does not list the membership, it is not surprising their are some real questions about value for money. Opinion is mixed on the palm trees; more than a few people think they are ugly and no more connect with the landmark deodars tnan a row of saguaro cactus would; other than that, they are better than hardscape, at least. The new landscaping was not advocated by a small group of individuals.....A professional Pasadena landscape Arcitechtural Firm was hired and submitted concepts...Transparency ???? I love Deodar Trees on White Oak Ave but would not like having a dark pine tree canopy that blocks out the sun. A drive by shopping District needs to bright open and visible. My "counterproductive" joke seems to have provoked an interesting discussion, but if you really believe that there's no room for joking (on April Fools Day! ), griping, grousing, and debating the things that plenty of people in this town care about, then you're on the wrong website, buddy. If "diversity in oponion is good" (sic), then why get bent over the criticizing and second guessing? It's a town of 50,000. We're not going to have "uniformed" (or did you mean "uninformed"?) opinions, or even op-onions. You put something in the middle of town, people are gonna have things to say. Get used to it. We're supposed to hold our tongues until the whole thing is complete, which as you said in an earlier post could take years? Get real, man. That's like saying you can't criticize a blueprint until after the house has been built. Wow, either the residents and businesses in Granada Hills lack a sense of humor, or they lack an IQ to process an April Fool's joke. As funny as the inability of certain people to get the joke is, it actually reflects a divide between residents and property/business owners in the community that is very real, and which ultimately will be taken advantage of by those who understand it. The root issue is that these actions are being taken, as always, by the same people who have run the chamber and BID for years, and who are about as independent of CD 12 as a poodle - despite the fact that CD 12 pisses on them repeatedly (Street Fair, anyone?) and tells them it is raining. Given the general distate among the residents of Granada Hills toward CD 12's designs on Granada Hills, which goes back to Hal Bernson's brainstorm regarding tearing out the deodars to widen White Oak in order to accomodate the traffic expected from the Home Depot (planned for what is now Granada Village South), and then Greig Smith's support of the Kohl's planned for Granada Village North, there are only so many times residents can be surprised by these sorts of decisions without generating some questions. Without any involvement/consultation/public meetings with anyone outside the OGHRG (Perhaps the Neighborhood Council? They are elected by the community after all, have more legitimacy in that sense than anyone else does, and have been willing to host forums on the council election and the VRHS#4 applicants), what a surprise, when a major change in streetscape happens, residents wonder what the heck is going on in their little corner of LA. If the BID or Chamber had a website that actually existed, was updated, or offered any information about these plans, perhaps the BID might get slightly more community buy-in then when a bunch of septugenarian property owners, who may or may not live in town, make decisions in the back of the Chamber office, up at Porter Valley, or in the CD 12 office. Or, most famously, at Baker's Square - how'd that one work out? I normally would let this type of discussion pass at a certain point ....however I know personally the many many hours invested by dedicated civic minded individuals who have worked very hard to make this all a reality and will just follow what is said and speak when necceesary. I always heard that Cheryl Ford never kept track of the BID money very well. One time I heard a woman from the OGHRG say she must have sent her son to college with the money or something. I don't get why you're fixing up Chatsworth Street now instead of before it became a desolate, boarded up street. There are a few businesses, a lot of massage parlors, and tons of For Rent signs. But since you decided to do it, perhaps in the hopes of actually getting tenants there, you could have at least chosen a native tree. You're not going to make it look like Sherman Way are you? Uh oh. Now the whole city thinks it was In and Out! That Cicarelli guy is gonna freak out if someone else takes credit for his dream. Personal attacks on people doing good ????? Concerened that stores are vacant..???? So if nothing is done ...there would be those who complain.......now that something is being done.......we need permission from every homeowner on what tree specimen ????? Perhaps there needs to be a review of people's paint colors and garderning choices....Sure why not ? Unbelievable how people can slander volunteers who have put a great deal of their own time, blood, sweat, and money into this community. One of the great things about Granada Hills is the joint effort by volunteers on the Chamber of Commerce, Old Granada Hills Residents Group, Granada Hills South Neighborhood Council, Granada Hills North Neighborhood Council, Granada Hills Rotary, Granada Hills Improvement Association, and other volunteers who simply step in and lend a hand. Granada Hills is truly the most neighborly town, but it seems that some people want to gripe about things of which they know nothing, and create disharmony. PS: The Palms are awesome! Although I am not normally a fan of Palm Trees, the ones on Chatsworth Street look great and really add to the flavor of the street. I see some construction happening also, and look forward to seeing it. Thank you to the people who are working hard to improve our town. I am on the board of the Granada Hills South Neighborhood Council and have heard great appreciation from local residents and businesses for the new Palm Trees on Chatsworth Street. Good Work! Am I the only one who noticed the installation contractor(s) are violating the peak hour ordnance and the Work Area Traffic Control Handbook, creating traffic gridlock on Chatsworth? Compliance with both is required -- it's a part of the plans submitted with "B" Permit # 8032. "IN ADDITION TO SIGNS REQUIRED BY THE PROVISIONS OF THE 'WORK AREA TRAFFIC CONTROL HANDBOOK' (WATCH), LATEST EDITION, FURNISH AND PLACE SIGNS FOR GIVING ADVANCE NOTICE TO MOTORISTS OF TRAFFIC DISRUPTION AS PART OF THE PROJECT [...]"
All traffic lanes [...] shall be unobstructed from 3:00 p.m. to 9:00 a.m. of the next day. One lane may be closed at all other times." See that??? Get off the street by THREE O'CLOCK for the afternoon rush, not 4-ish. If your crane service is behind, that's not my problem. I thought GIGA GRANADA HILLS was to allow us to talk about the good things happening in Granada Hills. Why does it appear that someone is using this site to create controversy where none previously existed? We have a lovely neighborhood with the most wonderful people, and good news is always appreciated. Well, it's really just about anything connected to Granada Hills. I'm not much of a pollyanna. Wow, I just came across this story and am really taken aback by the negative comments about the trees and Chatsworth. The entire area desperately needs revitalization and people are going to nitpick over the type of tree used? It's California for Christ's sake, Palm Trees might not be indigenous but they fit and are attractive. I am still stunned by the stupidity the internet has unleashed. I live in Granada Hills. The trees are ugly, the markers at each end of the "beautification project" are unreadable and the food trucks have created a parking and driving nightmare in what used to be a quiet neighborhood. Thanks but NO THANKS!! !